Whenever Gay pride comes along, my thoughts go to the late Jack Nichols, one of the first gay pioneers who picketed in front of Independence Hall in Philadelphia and in front of the White House back in the 1960s for rights that most Americans took for granted – to make a living, have a family and simply enjoy life without fear of imprisonment, humiliation or worse. These brave individuals were part of a select few who came out at a time when being gay was not only taboo, but also illegal. If you were ‘outed,’ your life was pretty much over. And their activism came years before the Stonewall riots in 1969. In fact, when they staged their rallies they were all dressed professionally in order to look employable. They endured insults and ridicule from people on the street, but they refused to hide – it was the time of the Civil Rights movement in the United States, and many minority groups followed in Dr. Martin Luther King’s footsteps to demand their rights under the United States Constitution. 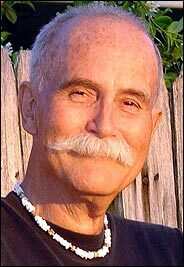 I am proud to say that for a few brief years, I had the honor of considering Jack Nichols a friend. We were never very close due to our age difference (he was almost exactly 30 years older than me), but he was one of the first people I became close to after I relocated to the US in 2000. The first time I was in touch with Jack was when I started writing for an online publication called the Greenwich Village Gazette in 1999, where we both contributed a weekly column. My column was about life in Brazil, while he wrote about gay issues in America. I was taken by his talent and style and started exchanging e-mail messages with him. He was the editor of LGBT news site GayToday, and when news broke about gangs attacking gay men in Sao Paulo, he invited me to write a piece on it. From then on, I became a regular contributor to the site and remained so until its parent company decided to cease publication in 2005 (the site returned in 2010, but I am no longer involved). After I relocated to the US, we frequently talked on the phone, and in February 2003 my then-wife and I visited him in Cocoa Beach, Florida, where we spent a few days. He was a graceful host and a great conversationalist and also had great insight on peoples’ personalities – I will never forget when he pulled me to the side to tell me that my relationship was clearly coming to an end. I was shocked to hear this, but in the end he was right: that relationship came to an end later that year. We talked regularly on the phone until shortly before his death. I knew he’d been battling cancer for number years, but he always pulled through in the end. He never complained about his health, and was always cheerful on the other side of the line – so his passing in 2005 came as a shock to me, since I just figured he’d beat that latest crisis and that we would be able to talk again soon. I thought of Jack when I saw the movie Beginners (starting Christopher Plummer). 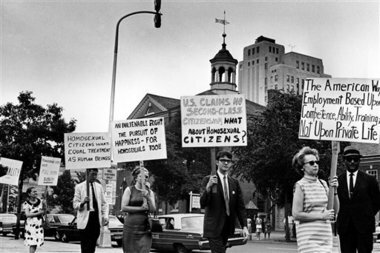 The film briefly mentioned the early gay protesters in the mid-sixties, and you can briefly see him with his picket sign during one of their rallies. I couldn’t help but think what he would have thought of President Obama’s recent statement in support of marriage equality or the ludicrous Tea Party movement. He was a truly gifted man, and five years later I still miss our regular phone conversations.